When the dealer passes on the up card, every player has had a chance to give the up card to the dealer, but no one did. What does this mean? If the dealer's opponent orders the up card, this puts it into the dealer's hand - giving his foe an extra weapon. It means that the opponent probably has a pretty strong hand in that suit, enough to negate this action. So if they pass, it means they probably don't have a strong hand in that suit. And if the dealer's team does not order the up card, they are passing up the opportunity to get 1 extra trump card. So it also probably means that neither player has good cards in that suit. The fact that everyone passed on the up card indicates that everyone is weak in that suit, and may have a stronger suit that they are looking to make trump. This all made sense. The part of the squirrel's strategy that jarred for me was the statement that "when the dealer passes [on the up card] they usually want the other color". I thought of times that I had passed on the up card because I had a perfect loner in the "next" suit - not the other color. For example, the up card was hearts, and I had a loner in diamonds. In those cases, if first seat called next, they'd be euchred. I wondered just how good this strategy was, in practice. I searched the internet and found that the "Next" strategy has been described at the Vegas Euchre and Ohio Euchre websites. It is known to work, but I didn't have any hard evidence. I decided to run a test. The 'up card' is a Jack. All 4 players turned down the 'up card'. First seat has an Ace in a suit other than the "next" suit, if they only had 2 cards in the "next" suit. This was not required if they had 3 or more cards in the "next" suit. If all of those conditions were in effect, the bot in first seat would call the "next" suit. After programming the bots this way, I ran a large number of simulations in which one pair of bots used the "next" strategy versus opponent bots who did not. Over a large number of games, the only difference in strategy between the two teams was that one team used "next" and the other did not. The results came out overwhelmingly in favor of the "next" strategy! There were a total of 2373 hands played where the above conditions were met. Of those, 1924 - 81% - were won by the bots using the "next" strategy. 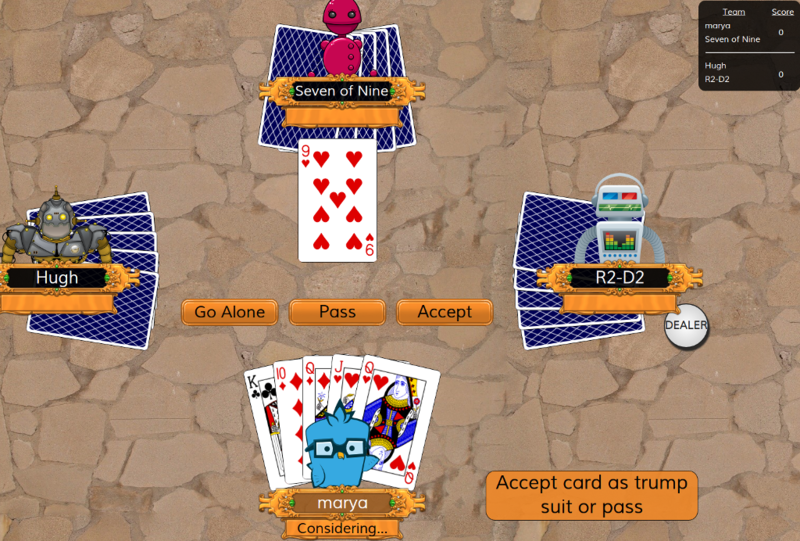 Since this worked so well, I programmed the bots to use the "next" strategy when the up card was a 9, the weakest card. This worked about the same. A total of 617 hands were played where the "next" strategy was applicable, and 82% of them were won by the team using the "next" strategy. Using the "Next" strategy sometimes requires that your team play defensively [Edit: see next paragraph for new info]. Ohio Euchre says "In a hand where you hold two small cards in next, but no power, try leading an off suit that you think your partner may be able to trump". So if you are calling "next", you should not lead with a trump card unless your hand is strong in that suit a non-trump suit. If this is not so, lead with a weak, non-trump suit, hoping that your partner will trump it. If possible, don't lead with a non-trump Ace, either - you want to try to save it for when trump is exhausted from all hands, so it can't be trumped. "The best first lead on a next call is a small trump, this is especially true if you hold an off suit Ace... you stand the best chance of hitting your partner's hand" [in the likely event that they hold a bower]. They go on to say that this will probably clear out trump cards from your opponents' hands, making your teams' Aces safe to play. So if your teammate called "next", and you wind up with the lead on the 2nd trick, you should lead back with a non-trump Ace if you have one. If you hold the right bower, don't lead with it unless the left bower was the up card. If holding the right bower and the Ace of trump, lead with the Ace, hoping left is in your partner's hand. "if your partner calls next and leads trump. DO NOT lead trump back.... this move almost always results in being euchred"!!! Here's a replayer where the "next" strategy backfired. The dealer turned down the Jack of clubs. Some would say this was a mistake, because he would have had both bowers had he called it up. In any case, he had a pretty strong hand in spades - the two highest cards, once first seat called up spades as trump. This demonstrates how using the "Next" strategy can lead to being euchred. To be sure, the "next" strategy does not always work. But it works so often that you'd be unwise to ignore it. Play Euchre at World of Card Games! You can play against other people from all over the world. 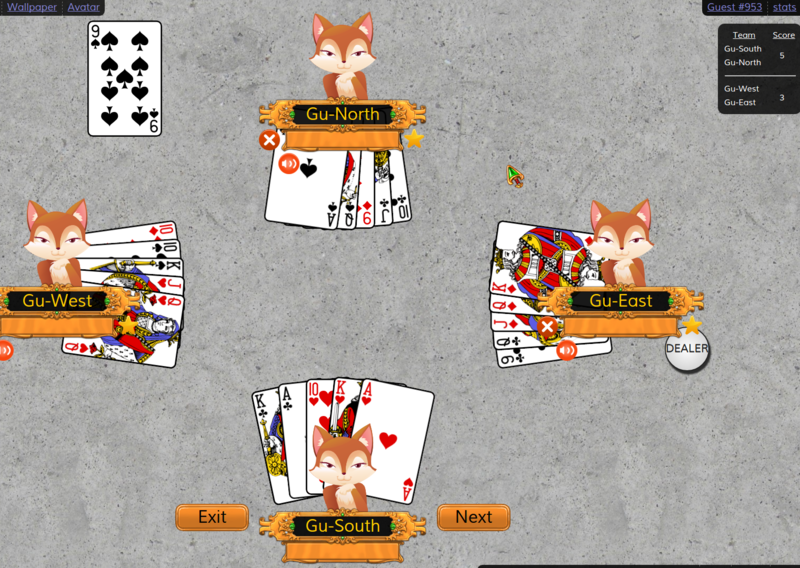 You can also learn by running through the Euchre tutorial. Play Euchre at World of Card Games now!